Habitat: Desert, Upland. 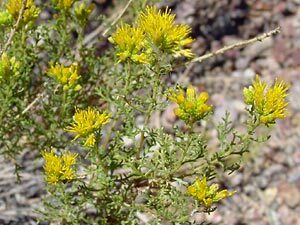 It grows in dry, sunny, open, disturbed areas like roadsides, graded areas, and in overgrazed pastures and rangeland. Description: The rayless flower heads are in rounded clusters at the tips of the woody stems. The leaves are alternate, dark green, small, thickened, gland-dotted, and pinnately-lobed with linear, point-tipped lobes. Poisonous – The plants are poisonous and contain the toxic substance tremetol, which can cause the "trembles" in animals that eat a large quantity of the plants. Horses are the most affected. 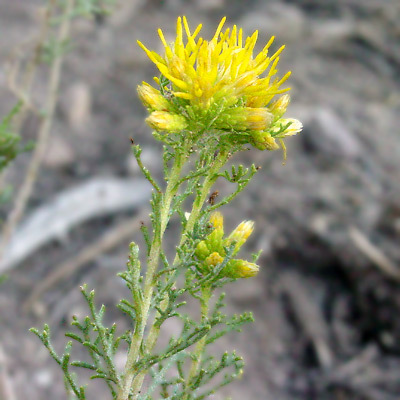 Humans can become ill with "milk sickness" from drinking milk from cows that have grazed on Burroweed. Fortunately, the plants are foul-tasting and usually avoided by livestock unless there is nothing else to eat.